I was born in the East Coast of Malaysia in a small hamlet called "Mersing" which was a place of retreat for the British when they were there. My father worked as a Chief Clerk with the Police Department during the British era and continued to be in the civil service until retirement in 1980. The Mersing town is the connecting point to the Tioman Island (Pulau Tioman) which is famous for its pristine beaches. I went to Singapore to study law in the early 80s. I am currently, not in pursuit of my legal career in view of my health and other reasons. I live with a cat and two dogs. I was inspired by the my father's life in the civil service and the changes that took place in Malaysia and the infiltration of the dominant cultures especially the ones dominating commerce and finance and government into the more obedient, marginalised, orphaned minority cultures over a period of 50 years and the prevalent use of supernatural and paranormal elements in the conduct of life. And not to leave out, the ancient beliefs of the Malays and those related to the rainforest - which is the oldest in the world. 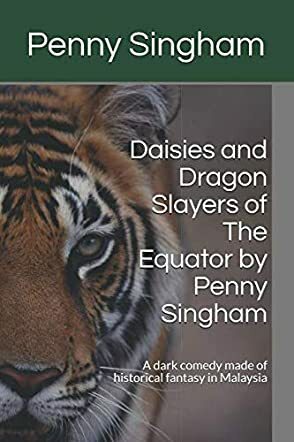 Daisies and Dragon Slayers of the Equator by Penny Singham is both adventure and drama with fine hints of the supernatural. Set in Malaysia after the end of British rule, the story's narrative centers on the classic case of an arranged marriage. Oormila, the only daughter of a high-ranking civil servant, runs away from an arranged marriage. Feeling hurt and dishonored, the would-have-been groom, VK, uses supernatural powers to get his revenge. And as if this isn’t enough to make the girl’s life miserable, she teeters towards a more tragic end while the one person who may have the chance to save her is running against time. Penny Singham's novel is for readers who enjoy drama, the kind one watches in Indian movies. The tone is light but surprisingly gripping. The author provides very interesting elements of the background, offering images and ideas that allow the reader to understand the cultural and historical characteristics of the setting. The female protagonist is immediately introduced, together with the conflict that moves the action forward. The plot has a powerful premise — it is bold and dramatic. Refusing an arranged marriage is something unheard of; it is like bringing dishonor to a family, an act which breaks the bond between two families. It is an act of courage for the heroine, but one of insult to her groom to be. This is the conflict that gives birth to the action that runs through this intriguing story. I loved the emotional and psychological implications of the themes and the realism that permeates the narrative makes it enjoyable to read.